Oh mylanta!! If this story is the beginning to this amazing family, I cannot wait for the next one or the next! Oh how I wish that Lake Starlight was a real town and it’s residents were real. And the “Buzz Wheel”! Oh that’s a mystery wrapped in an enigma. Austin Bailey is the unorthodox patriarch of the Bailey clan. He has to grow up way before his time and feels like he never had a chance to fulfill his dreams. Holly Radcliffe finds herself in Lake Starlight. She is the mysterious newcomer to the town. What secrets does she hold? Read this story! From the title you can tell that Austin & Holly’s chemistry is off the charts! And a one night stand can turn into so much more. I floved the push and pull of their relationship. It made me want to smack them upside the head and then hug the hell outta them! This is Austin and Holly’s story but it is so much more! This is the fantastical introduction to the whole Bailey clan and the lovely town of Lake Starlight! 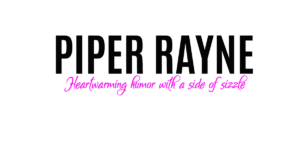 I think this is going to be the best series from Piper Rayne to date, I can say that honestly because I have read everything that this dynamic duo has written! Get your hands on this! Get submerged in the world of Lake Starlight and the Baileys….